Tassimo is the only home brewing system on the market today that gives everyone what they want. 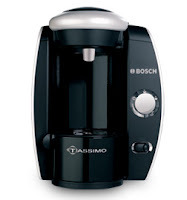 I received a Tassimo Suprema Hot Beverage Machine by Bosch with three packages of TDiscs to try out, and I’m not going back to my old coffee maker ever again! Papa Bird is a tea drinker and I am a coffee girl so we would have to boil a pot of water plus make a small pot of coffee in the mornings. I hated making a small pot of coffee just for me. I always made too much and being the “waste not, want not” girl that I am, I would always drink all of it. So on days that I accidentally made too much, I would be bouncing off the wall after my fourth cup. The Tassimo system is designed to make you one serving of (insert hot beverage of choice here). This is perfect because we each can have our hot drink and they take about a minute to make. Even better if you have a bunch of people over for dinner, you can offer more than just coffee or tea. The Tassimo system uses special Tassimo Discs (T Discs) and each disc has a UPC code on it that, when inserted, tell the Tassimo what it is and how long/hot to brew the water for before dispensing it into the cup. Different drinks require different brewing time and each T Disc has the perfect amount of brewing time coded right on it. One other feature I like is the ability to add more hot water. You canhold down the btuuon at a certain time during brewing to add more hot water if you like. This is helpful if you don’t like a particular drink as strong as it is originally made. Included with your Tassimo is a special disc that when inserted into the machine, tells the Tassimo to run hot water through itself to clean. They sell T Discs from popular coffee and tea manufacturers such as Starbucks, Seattle’s Best, Nabob, Maxwell House, Gevalia, Tazo and Twinnings to name a few. They are also quickly coming out with new flavours. I just read that they’ve got a new Caramel Latte Macchiato that I will have to try to find (I love Caramel Macchiatos). Right now my favorite is the Chai Tea Latte. The lattes and cappuccinos also come with their own creamy milk that you add after your initial brewing. Imagine a coffee maker that can produce a perfectly frothed cappuccino — heaven! You can purchase their full range of flavours and hot beverages through their online store. Plus when you purchase and register your Tassimo, they will send you a gift (in Canada it is two coupons for free packages of T Discs. Their T Discs are also available locally in many stores as well. I’ve found them in Superstore and I’ve found the biggest collection of them yet at Home Outfitters (if you get those 20% off Home Outfitter coupons in your flyers, you can use them for those). They even have a Beverage Recommender online that you can check out if you are unsure of what to order. I love my Tassimo. My coffee maker has been packed up and stored away. I never thought I would be able to enjoy such wonderful coffees at home. This machine is definitely a money saver in the long run if you love to drink coffeehouse-quality lattes, cappuccinos, coffees and hot beverages without paying coffeehouse prices. I also love that I don’t drink as much coffee as I used to because I get a perfect serving every time. This system is so easy to set up and use and it is very compact and stylish. The lights on the front tell you when it’s time to fill the tank with more water or when it needs to be cleaned and after it is done making your drink you just open the top and take the T Disc out. There is no clean up or rinsing out and it is ready to go for the next drink. The Tassimo Suprema Hot Beverage Machine by Bosch sells for $169.99 and is available through their online store or at most retailers where coffee machines are sold. For those of you that have a Tassimo, how do you like it? What’s your favorite hot bevy? 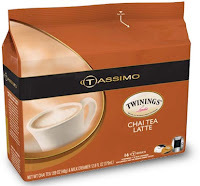 * For the purpose of this review, I received one Tassimo System with 3 packages of T Discs. The opinions expressed on my site and in this post are my own and are in no way influenced by any companies or products that I may receive. Anonymous – I agree that having something that is recyclable would be good. I just don't like that the Keurig is only limited to Coffee, tea and hot chocolate drinks. Myself, I love that I can have my latte's, and cappuccino's with the real milk frothing on the top and I love having the ability to have fancier drinks without spending an arm and a leg for them. I just created a new drink that I call a Hazy Choco-Latte. It is a hot chocolate, with a latte and some hazelnut cream – to die for and the whole thing cost me $1.50 to make. So hopefully one day Tassimo will make a recyclable option for their TDiscs, but my choice is still with the Tassimo for the variety. Nadine – I will have to try that peppermint mocha next. Thanks for your feedback guys! I prefer my Keurig personally. I like the Tassimo, but my Keurig won. They both make great cups of coffee but I was able to get a reusable filter cup thing for my Keurig that wasn't available with the tassimo. The reason I was hesitant to either of them initially (while I loved the coffee they both made) was all of the waste. The cups aren't recyclable unless you dig out the coffee innerds, which wasn't the easiest at the time for the pods of either machine. We love our Tassimo! It's my absolute favourite thing we own!! My favourite coffee is peppermint mocha's – a mix of hot chocolate, a cappucino and peppermint syrup. Great review too, made me crave a coffee! !